Lyle: Here are some basic to advanced warm-up exercises for getting your left hand fingers and your right hand picking in sync. The first thing to do is work on your picking hand. 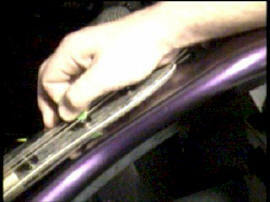 Anchor your right hand back on the bridge so you're slightly palm muting the low E string. Lyle: Now place your left hand index finger on the 3rd fret of the 6th string and pick down then up and keep alternating. Lyle: This is called "alternate picking". Watch the video clip to see this. Lyle: Next is what I call the "4 finger exercise". Again, always use the alternate picking method. Start with a down stroke. Lyle: Make each "beat" even. Start out slow. Watch the video of this ex. Lyle: This next one is a little harder. It's just like the last one only the order of notes is changed. This will be tricky at first. Lyle: The left hand pinky finger seems to need the most work. This next exercise helps. Lyle: When you are playing scales over the fret board, there will be times when the patterns aren't the same from string to string. Lyle: This next exercise helps get your fingers used to pattern changes typical with the major and minor scales. Lyle: This next exercise works on two things: string skipping and finger stretching. Lyle: Next up is an advanced exercise. First learn this simple scale pattern called the G minor pentatonic. Lyle: Now you'll sequence the scale in groups of 3's. Lyle: This lick or ex. doesn't sound like much at slow speed, but when you speed it up....watch out! Here's a sample audio clip of me playing this at fast speed. Lyle: Now learn this A major scale pattern for the next exercise. Lyle: This time you'll work this scale pattern in sequences of 4 notes at a time. The next tab shows you how to do this with the first octave of the major scale. Lyle: Once you have this down, try the complete pattern spanning two octaves. Lyle: Here's an audio sample to listen to. Lyle: I like to use all these exercises for about 15 - 20 minutes everyday to warm-up with. Lyle: You can play these patterns everywhere on the neck, not just the places you've learned here. 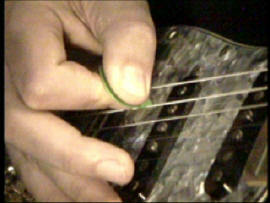 For example, try moving any of the patterns up 1 fret.